Naivasha is a rural big town at the edge of Lake Naivasha, just 100 km west from Nairobi and 70 km east from Nakuru. Farms, cattle, flowers (plastic industrial farming). Populated area. The Lake Naivasha is beautiful, surrounded by the rift scarpment and you can see flamingos and pelicans (even for free!). 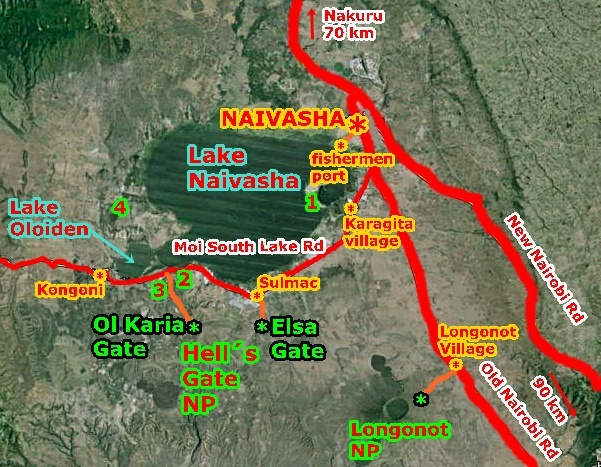 Naivasha gives also access to Longonot NP (volcanoe) and Hell´s Gate NP (walking, bicycle). 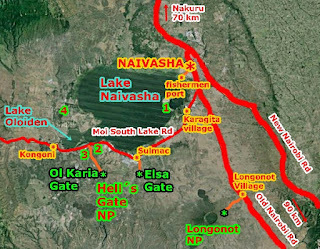 Lake Elementia: the main road from Nakuru to Naivasha (Nairobi Road) passes on the southern part of this soda lake. 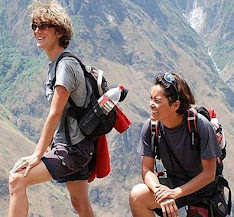 Mmany camps, most of them expensive, only camping can be a budget option in some of them. Beautiful views! In this area, between Elementeita and the crossroad to Naivasha, we saw zebras, impalas and baboons on both sides of the road!For free! Note: Now with the New Nairobi Rd, big traffic across Naivasha is more limited, cause it´s the Old Nairobi Rd. Nakuru-Naivasha: matatu, 180 sh, 1 h.
Many vans to Nairobi and to Moi South Road (southern shore of lake Naivasha). Also Nyahururu and Narok and other main towns in the area. 2 main matatu stations in Naivasha, in the center, not far. Just ask locals or have a look around. Not so many buses. Many boda-bodas (moto-taxis) around and a few taxis. WARNING: in Naivasha, they try to charge you more as foreigner! Bargain hard. Kongoni is only 35 km away and the lake camps 10 or 20 km… It shouldn´t cost more than 100 sh. Around the center, there are many local lodges (most of them yard style), really cheap (600-700 sh). New Four Seasons Lodge: where we stayed. Price: 800 sh (usually it´s 1.000 sh, with breakfast, but we negotiate without). Self contained single room with ¾ bed. Hot shower. Clean. Big building just next to the mosque, quite quiet (in African standarts). Sam´s Inn (another big building next, on many guide-books) is closed (may 2015). All over the southern shore of Lake Naivasha, surrounded by flowers farms, many camps and lodges, focused in expats and foreigners.Very popular on weekends (Nairobi is just next door). Two main areas with camps: a group of camps 10 km away around Karagita and another one 10 km further around DCK-Sulmac. 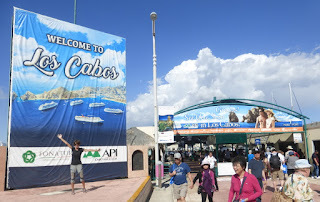 In this second area, you can also find cheap local lodges (less than 1.000 sh/room), good plan if on a budget and wanting to visit Hell´s Gate NP. Only camping is not expensive (around 600-800 sh/pp). Dorms or bandas cost more than 1.500 sh/pp, this is in the "cheap" camps, cause there are also luxury ones. Fisherman´s Camp (DCK) seems to be the most popular, according to boda-boda drivers in Naivasha. Forget about Kikopey Nyama Choma Center (it´s just an horrible trucks-stop on the main Nairobi Road, in Gilgil (30 km north of Naivasha and 40 km from Nakuru). Do you want to eat meat, Kenya style? Naivasha is the good place! There are plenty of butcheries in the center. Just smell! Have a look and choose. 400 sh/kg. Beef, goat, chicken. Big national supermarkets (Jamaa, Naivas), even a new shopping mall (Tuskys) west of the center near the highway. Also a big fresh market. Not too much in Naivasha town, just experience the butcheries. Want to see flamingos and pelicans for free? There are at Naivasha fishermen Port: just walking distance from the center, crossing the railway station and tracks, there´s an acacia forest and cattle lands and you will reach the Lake Naivasha (around 30 minutes walk from the center, you can also take a boda-boda).The birds are there, for free! Great views over the lake, Mount Longonot and other hills. Naivasha fishermen port: you can also buy cheap fresh fish dircetly to the fishermen. They can even cook it there in a small basic restaurant. The port is a famous place for local people: birds, fresh fish and even photographers and boat-safaris to see the hippos, for 400-500 sh (expect to pay around 3.000 sh if you do a tour from the camps). There are slums in the Naivasha lake area, out of town. But the walk to the lake is safe as many people walking around and also boda-bodas. 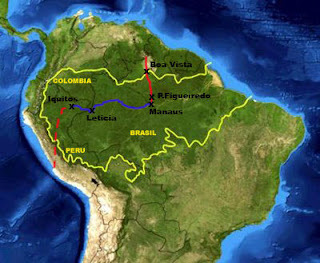 Even if we didn´t go, here´s some information we got. Following Moi South Lake Road (many matatus on the tarred road), to reach the different camps on the lake. Maybe some wild animals around as there are also small protected areas surrounded by big flowers farms (check with google maps-sattelite). On the northern shores, many farms. There are many farms in all the area, but also wild animals can be around (incredible). Lake Naivasha is not a national park (it´s manily a industrial farming area) but there are many very small reserves around the lake, with entrance fees 15-30$. From east to west, Crescent Island (1), Elsamere (2), Oserian (private(3)), Crater Lake (4). Famous for birds and antelopes but also other animals... basicly expensive lodges with animals. Around Karagita village, 10 km south, 40 sh by matatu from Naivasha, we saw a “Karabita beach” sign, so maybe there´s a public access to the lake there too, surrounded by camps-lodges and flowers. Elsa Gate, just off the main Moi South Lake road, near Sulmac- DCK (20 km south of Naivasha). Where you have tourist camps and local cheap lodges. The other gate, Ol Karia, is 10 km further on the same main Rd. Famous cause you can walk or ride a bicycle inside, with cliffs, gorges, geothermic area, and animals (no dangerous ones). Entrance fee: 30 $/pp. Bicycle not included!!! We find it expensive, like always in Kenya! Rent a bike must be easy at the gates or camps (around 500 sh). It´s a pyramid mountain (in fact it´s a volcano with a crater, 2.800 m high), south of Lake Naivasha. ou can climb without a guide. Return hike (including crater loop) around 5-6 h.
Access via Old Nairobi Rd. From Naivasha (20 km east) there are matatus to Longonot village.